One of Jake's favorite things to do is to lick Hope. Daily we wonder what goes on in our furkids’ heads. I’ve read several books on dog behavior, but What Is My Dog Thinking? by Gwen Bailey, a British animal behavior counselor, has been the best so far. The 96-page book, which I found last weekend at Barnes & Noble for $8.95, has color examples of many breeds displaying behaviors either alone, with people or with other dogs. A paragraph accompanies a photo. Bailey writes in plain language, no jargon and doesn’t talk down to the reader. It is informative and entertaining. Some sections include Social Animals, Life in a Hierarchy, Staying Safe and Dogs and People. Jake, Hope and Windy have seen me reading this book. Glad they can’t read. But I still don’t know why Jake, the alpha, loves to lick Hope up and down her back. Maybe he enjoys the texture of schnauzer fur. 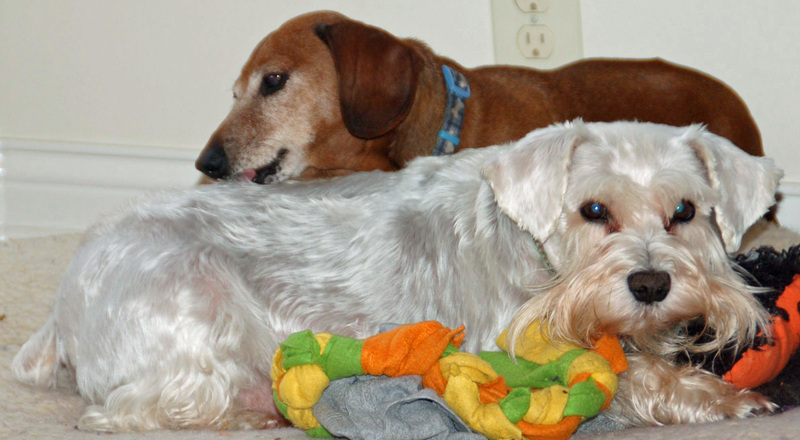 This entry was posted in Dachshunds, Dog Behavior, Schnauzers and tagged Dachshunds, Dog Behavior, Schnauzers. Bookmark the permalink.